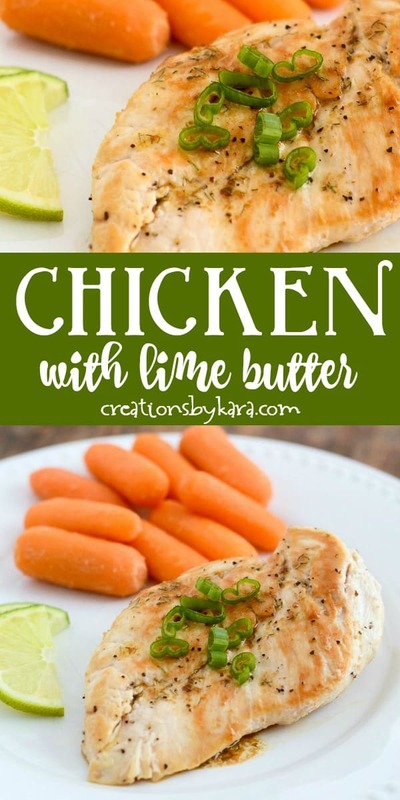 Chicken with Lime Butter is a simple and delicious dinner recipe that is ready in under 30 minutes. 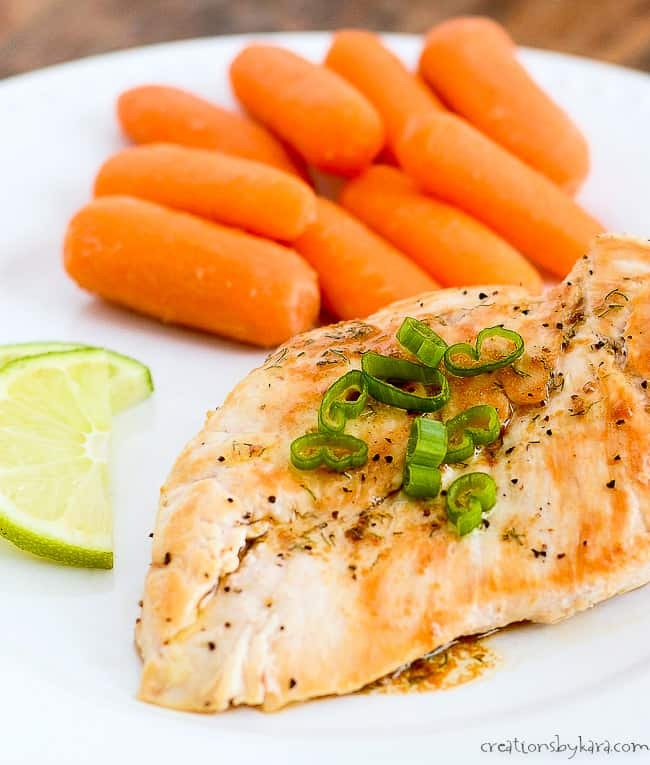 The lime butter sauce has a hint of dill and is packed with flavor! 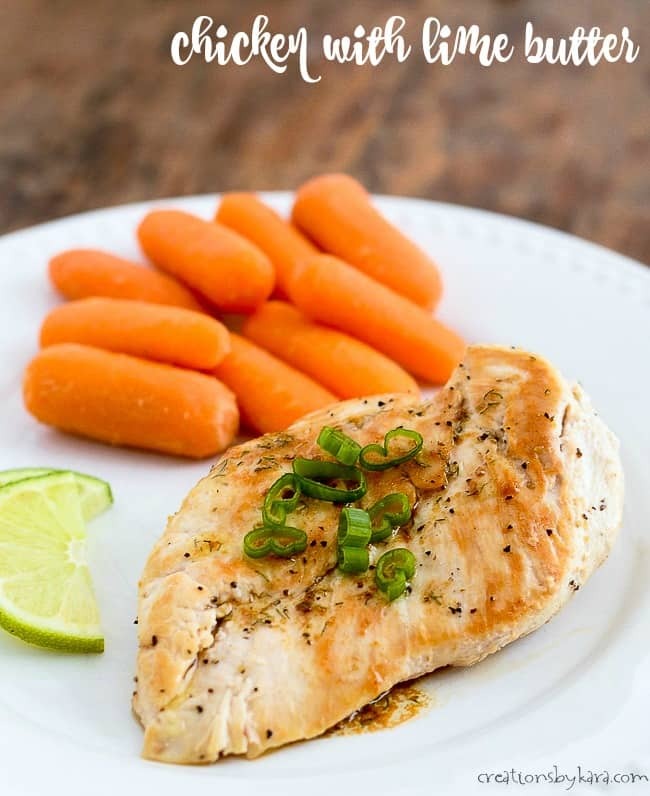 I like to serve this chicken with Sweet Cooked Carrots and Honey Lime Fruit Salad or green salad with my Homemade Ranch Dressing. Most weeknights are pretty crazy at my house, so simple chicken recipes like this are a staple. I discovered this in one of my Taste of Home cookbooks when I was looking for ways to use a lime I had leftover after making White Chocolate Lime Scones. It calls for very simple ingredients, so I was surprised how flavorful it was. 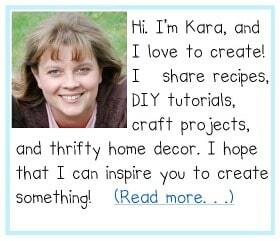 I didn’t have fresh dill, but I’m sure that it would be even better! For the sake of my kids, I just used the juice from the lime, but if you like a more pronounced lime flavor, add a bit of lime zest. I got a little distracted after adding the chicken back to the pan, and my butter browned a little bit. But it actually added a great depth of flavor that I enjoyed. Don’t you love happy accidents like that? As with all chicken recipes, you don’t want to overcook the chicken or it will be dry. I like to use a meat thermometer so that I can stop cooking it as soon as it reaches 165°. Salt and pepper the chicken breasts. Heat a large skillet to medium heat and add olive oil. Cook chicken in olive oil in a medium hot skillet for 5-8 minutes on each side, or until a thermometer reaches 165°. Set chicken aside and keep warm. Add butter to the skillet and cook till melted. Stir in lime juice and dill. Return chicken to pan and spoon hot butter sauce over each piece. Serve chicken with any remaining butter sauce and sprinkle with green onions if desired. 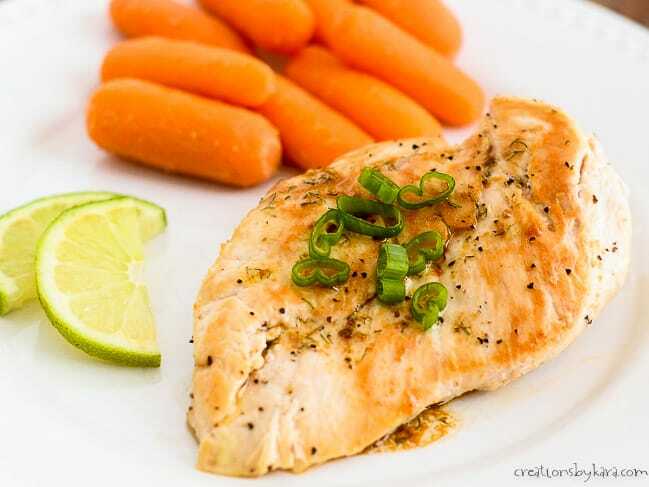 Tender chicken with a flavorful lime butter sauce. Sprinkle both sides of each chicken breast with salt and pepper. Heat a skillet to medium heat and add olive oil. Cook chicken for 5-8 minutes on each side, or until a thermometer reaches 165°. Set chicken aside and cover with foil to keep warm. Add butter to the skillet and melt. Stir in lime juice and dill. Return chicken to pan and spoon hot butter sauce over each piece. I can’t wait to try this chicken! And it’s such a healthy recipe! Perfect! I’ve had leftovers over a salad for lunch and it is a perfect healthy meal! Yum! I LOVE lime. Need to try soon! We use chicken for so many recipes & I love the variation from lemon. This looks so juicy! Can’t wait to give it a try! Making these tonight since I already have the chicken out!! Thanks! This sounds awesome, love the idea of using lime instead of lemon. I do love lemon, but sometimes it’s nice to change things up a bit! This was so good. The lime with it was the absolute perfect contrast.